QlikMapsQlikMapsFAQ/Common Scenarios UsageUpgrading to QlikMaps 3.0 - What's New? Upgrading to QlikMaps 3.0 - What's New? QlikMaps 3.0 marks a major milestone for performance and useability. In QlikMaps 3.0 we've reduced calculation time and improved map performance, and made major, requested changes to the properties panel. The properties panel has been completely overhauled to streamline building maps and remove many complications caused by working with expressions in the Sense editor. Grouped headings categorize the steps of building a map, only showing what you need when you need it. For example, you can pick a dimension and a color before moving on to building popups and managing drilling. This eliminates much of the scroll fatigue of previous releases. Choosing fields has become much simpler as well, with the addition of a default drop-down to select your dimension and measure rather than using the expression editor. Of course, expressions can still be used. Buttons at the top of each value let you quickly choose and change the type of map and method of aggregation, without writing a single line of code. In addition to cleaning up the properties panel with grouped headings and drop-downs, we've also automated many tedious steps. Based on the chosen dimension, QlikMaps now attemps to automatically choose the geographic dimension(s): Boundary for Polygons/Lines or Latitude & Longitude for Markers. Color expressions set in the first layer now propagate through all layers, varying the color between layers and giving visual distinction when drilling. 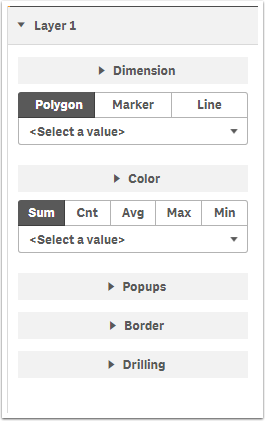 Popups are also automatically generated based on the dimension and measure. All of this automation is exciting, but we haven't forgotten about customization. Each dropdown or slider can be reduced to a related expression, and each automated step populates that related expression, giving you a template to extend and customize every feature. For detailed information about the new properties window in QlikMaps 3.0 check out QlikMaps Properties. We hope you enjoy QlikMaps 3.0! Prev: How does offline mode work?